We have seen that Sgt. Coffman noticed a hole in ceiling of the concrete room and attributed its presence to an explosion. We have also seen references to an explosion in several Autopsy Reports (see page 4 of Mt. Carmel 31 A and page 1 of Mt. Carmel 69). 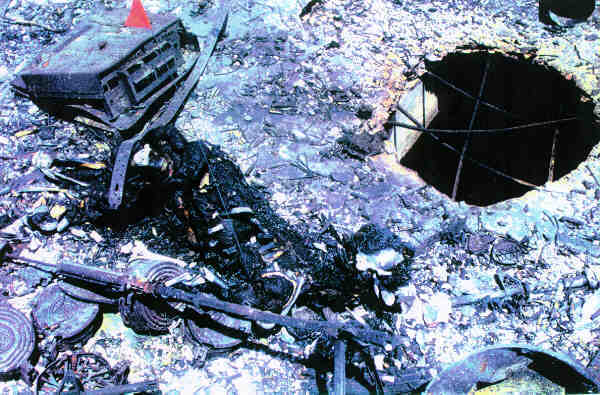 If the hole was caused by an explosion, it was forceful enough to knock a 18-24 inch hole in 6-inch steel-reinforced concrete. (see US News and World Report, May 3, 1993 and Newsweek, May 3, 1993). The curvature of the exposed rebar indicates the force came from above, and not from the supposed ammunition fire below. See Hole in Roof of Concrete Room, donated to the Museum by an unofficial source. Note the red flag, marking the location of a body. In the room beneath that hole, some 33 to 43 human bodies were found. An explosion that could have caused that hole, and the effect it could have had on either the dead or the living beneath it, is something that should have piqued the interest of "one of the finest forensic sleuths of our time," Dr. Douglas Ubelaker, curator of anthropology of the Smithsonian Institution. It also should have piqued the interest of the FBI, of the redoubtable Texas Rangers, and of the medical examiners. What would be the effect on living people if such a powerful explosion were detonated over their heads? Some of them might be injured or killed as a result. "Suffocation" and "buried alive" would be secondary effects of the explosion. "Blunt force trauma" may describe the proximal cause of death, but the manner of death should definitely include mention of a nearby concussion of that magnitude. Instead, the benign term "structural collapse," is repeated in the Autopsy Reports. Dr. Peerwani carried the story into the 1994 San Antonio trial with his testimony. But there is little discussion of what might have caused the "collapse." As discussed earlier, collapse is not slow erosion over time. Collapse is sudden and relatively brief. The American Heritage Dictionary definition: "1. The act of falling down or inward, as from loss of supports. 2. An abrupt failure of function, strength, or health; breakdown." 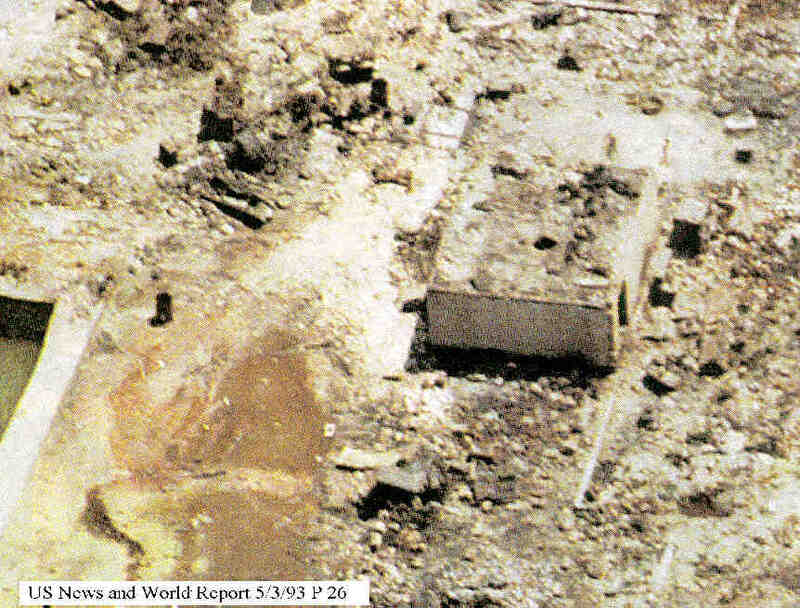 Note that "collapse" does not describe the effect on concrete slab when a bomb punches a hole in it, unless the slab subsequently falls down "from loss of supports." Collapse describes the inherently passive action of a falling structure or body. It does not describe a structure battered to the earth by explosive force. We notice that our attention is called to the gruesome remains in the concrete room, but we are expected to ignore the hole in the ceiling. In this case, deliberate avoidance of the subject is suspicious: In the presence of murder, the motive for hiding evidence is often to avoid incrimination. If the explosion in the roof could have been caused by Davidian armaments detonating in the fire, there would be no need to de-emphasize it. We might infer that US Special Operations or FBI/HRT commandos prepared and detonated the destructive device that damaged the roof. The story of "bunker collapse" was prepared in advance to launder the bodies and disguise evidence of death by other causes, in other places, at different times. Perhaps the device was intended to bring tons of concrete raining down on the bodies inside, obliterating evidence of anything else, but when the device was activated, it failed to destroy the room and make it collapse. But the game was too advanced to concoct a new cover story. As the country and western singer croons ". . . and I can't prove it, but that's my story and I'm stickin' to it . 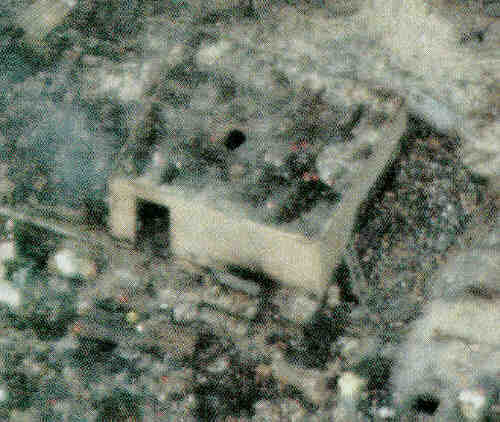 . . "
Recall that the concrete room was bulldozed within two weeks of the fire. (Dallas Morning News, May 1, 1993) Why would anyone so brazenly destroy key evidence, unless it was incriminating to themselves? Next: Eeny Meeny Miney-- DOE!